Today we’re celebrating that on Aug. 18, 1920, amidst much protest, Tennessee became the 36th and deciding state to ratify the 19th amendment, which would give women the right to vote. The bill was sent to Washington, D.C. and on Aug. 26, 1920, the Nineteenth Amendment to the United States Constitution became law granting women their right to vote in the fall elections, including in the Presidential election. 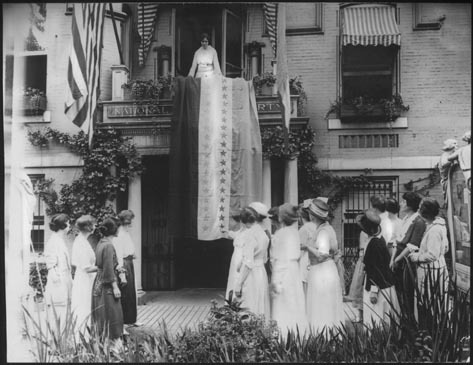 Above: Alice Paul, American suffragist leader, unfurls a banner after news of the Tennessee ratification of the Nineteenth Amendment reaches National Women’s Party headquarters. It’s hard to believe women have only had the right to vote for 90 years. As much as we love to read 17th, 18th and 19th century literature and watch costume dramas, and as much as we wish society still practiced some of the old rules of etiquette, we sure are glad some things have changed. For example, we can now go outside unescorted by a male relative or family friend; we can own property; and we can vote. Re-find your inner suffragette and exercise your right to vote during the elections in your state (get non-partisan political info through the League of Women Voters). It’s the polite thing to do, especially for those of us who at one time weren’t allowed to do it.